With the current version 6.1.1328 of SiDiary the mylife YpsoPump can now also be read via Bluetooth. 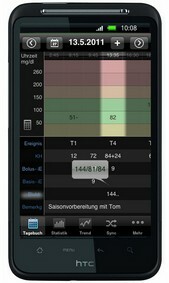 In our current update there is again something exciting: not only that we have added two new devices (the blood pressure monitor Beurer BM55 and the BG monitor Ypsomed mylife Unio Neva), we have also started to import the basal rates programmed in the pump into our basal rate management when reading out insulin pumps. You may have already seen it: with the current update for SiDiary it is now possible to read out the pump "IME-DC Dana Diabecare R" with SiDiary via Bluetooth. This update also includes an import driver for the Accu-Chek Guide, so you can now read it without the Smart Pix software from Accu-Chek. Also new is the import driver for the blood glucose meter MSP GlucoSmart Salsa and an import filter for the export files from the Ascensia Contour app. As you have certainly heard in all media in the last few days, the European General Data Protection Regulation (EU-GDPR) will come into force on May 25th, 2018. To continue using "SiDiary Online" as before, your consent is required again at this point. Today, we will send an email to all users to indicate that. All you need to do is log into your SiDiary Online account and agree to the new terms that will be displayed. With this update SiDiary can now automatically detect even more devices and provide the import more quickly. These include for example the Beurer GL44, the Fora Diamond Mini USB and the Stada Glucoresult ToGo. In addition, the devices Acon On Call Express, Testamed GlucoCheck Advance and Menarini GlucoMen areo 2K can now also be read out directly. With the current update to version 6.1.1319, new meters have been added in addition to minor modifications. The 'Ascensia Contour Next One', 'Ascensia Contour Next Link 2.4' and the 'eu-medical easypharm-GL' can now also be read out directly with SiDiary. So now there are two solutions for the 'Contour Next Link 2.4': either just read out the blood glucose data directly from the meter, or - as before with the import filter 'Ascensia Contour Next Link 2.4 (F)' - import the export file from CareLink with the blood glucose data and the data from the Medtronic insulin pump. 2017-11-28: SiDiary reads the Libre automatically! For all those who, like us, have been annoyed that Abbott no longer allows us to read out the Libre reader directly, we have good news: with version 6.1.1318, SiDiary can now automatically take over the data from the Libre software. SiDiary detects a Libre-Reader if it is connected to the PC and starts the reading process through the Libre-Software. Afterwards it exports these data automatically into a file and reads it out, so that it's data can be transferred fully automatically into the logbook. The easiest way to do this is to connect the Libre reader to the PC, then quit the automatically starting Libre software, start SiDiary and watch how SiDiary gets the data from it. Unfortunately, we have found out that under iOS11 the specially developed keyboard for entering digits can no longer handle decimal places. A few weeks ago, SiDiary Online moved to new servers in a new data processing center. In this context, some adjustments were necessary, but these are now for the most part completed. We would like to thank all our users for their patience and understanding towards us at this time. Thanks to the new servers, we are better able to meet the increased requirements due to our steadily growing user numbers, since in addition to the higher basic performance and failure security, the new servers are also scalable. In times of higher utilization, they can better intercept these load peaks. In addition, data transmission is now carried out with the latest SSL standards and encryption methods, and it is still cryptographically encrypted during transmission. Also on the server itself all data is stored coded. In the architecture we have also stored strictly seperately personal details on the one side and health data on the other side, so that data can not be assigned by unauthorized persons - even if they could crack it. Passwords are also irreversibly encrypted according to the best practices (keyword 1,000-fold hash code including random salt). Our system is continuously monitored by security specialists and fully automated with the latest known attacks, so that safety gaps can be detected and closed at an early stage. SiDiary is now among the few apps that have received the Diabetes App Seal from DiaDigital, because we meet their high security standards and requirements. With SiDiary you can be sure, that we will spare no effort to ensure the security of your personal data. For this we stand with our good name! Good news for all Smart Pix users with Windows 10: since the last major update, Microsoft has changed the handling for MSD (Mass Storage Devices). Since the Smart Pix was also affected by that issue, it couldn't refresh it's status message when all data was received from a meter/pump. Lately we received some support requests, that when trying to read out meters, users receive error messages and what they can do about it. We analyzed the problem and found out, that the tool 'Avira Antivirus', which is preferred by many users, is very often the reason. Avira Antivirus prevents, that a configuration file, which is strongly needed for proper operation ability, can be written by SiDiary (in a folder, which is created from and must be writable for SiDiary). We already reported this to the producers of Avira, but so far there was no change made by Avira. Either you click on the 5. button from the left in the SiDiary toolbar (Download blood glucose meter/insulin pump) several times. With each new attempt there will be written more of the file, until it's completed after 3 or 4 attempts - then it will show no more error messages. With today's update the direct import from Abbott Freestyle Libre in SiDiary is rounded. With the original Libre software you can add your own notes, which are then transmitted to the reader. So you can add these short texts after a scanned reading. With the update to version 1.6.1306 SiDiary reads these self-defined notes and adds them to the logbook as remarks. Another cool new feature is aimed at users who use on their smartphone or tablet the software 'mysugr'. With the current version of SiDiary now you can also import the export files, which you can send to yourself from mysugr as a CSV file via email. SiDiary 6.1 is now available for all users as a free update! With this new version we have not only introduced a new, brighter layout, but also a significant improvement of touch operations on tablet PCs with Windows operating system. Another cool feature is the integration of CGMS- and Libre data. You can now select in the detail logbook, whether you like to see the blood glucose levels as a table like in the previous version or the curve with the CGMS- or Libre data for that day. This makes it much easier to complete the logbook and add useful details for your diabetes team. Another highlight for users of Freestyle Libre from Abbott: the data can be read with version 6.1 directly from the Libre reader into SiDiary, so that it is no longer necessary to export them first from the Libre software. after we have issued on Monday for the app itself another update to version 1.0.37, we can finally report today after several days of intense observation, that the problem with the synchronization has been solved. We sincerely thank the beta testers, who have contributed with their reports significantly to solve this issue. Unfortunately our update from last Friday leads some users to an error message when trying to connect to SiDiary Online. This happens both when syncing, and when you register. Our developers are working hard on the analysis of this error, and as quickly as possible we will provide a correction update. If you are affected by this problem, we ask you for your patience and apologize explicitly for this inconvenience. We will provide then immediately with news on this topic. We're very sorry, but since noon yesterday there are problems with some DNS servers, so that a connection to our server with 'SiDiary Online' is not possible. Our Admins have done everything to resolve this problem, but unfortunately it still takes some time before these changes are spreading to all DNS servers. Currently the Antivirus tools Avast, Avira and Dr. Web recognizes a non-existent threat in SiDiary (False positive alarm). So we advise our users to add SiDiary to the exceptions of this tools until we habe clarified this issue with the manufacturer of these programs. As you can see there the file is correctly classified as harmless from most antivirus software (Like Nicrosoft, Kaspersky, F-Secure and many others. 2015-05-06: SiDiary available for Windows Phone! After long weeks of intensive testing we have now also released an app for Windows Phone 8/8.1. Along with the available apps for Android and iOS we were able to add SiDiary to another operating system for modern smartphones. The Windows Phone app can also be synchronized too with an account at SiDiary Online, our cloud solution, and thus fits seamlessly into the overall system 'SiDiary'. With the new update for SiDiary you can also import the export the files from the software of the Abbott Freestyle Libre into SiDiary! We recommend that you import it as CGMS data type as an entry of all data as blood sugar value would be too many data for the table. The CGMS data type you can be disabled for the logbook by using the menu 'Diabetes Profile ->Data types'. However, you can add this CGMS data type in the statistics as an additional data source. With the current version (1.0.12) of the Android app, you can now automate the synchronization with SiDiary optional. Either when you exit the app or at midnight each day. Of course, both in combination is possible too. With today's update SiDary Online will not only get a new look, but also a new feature: under 'Data -> Import' you can now also enable the import of your data from the iBGStar app. You get a personal e-mail address to which you can send the data from the app. If you then login to SiDiary Online the CSV-file sent from the app is available for importing and the data can be taken over by a simple mousclick. Please do not forget to assign in the import settings at SiDiary Online the names of your insulin. Please download and install this update to your iOS device. Then you will be able to sync again with SiDiary Online. Due to a bug in the latest iPhone update, the sync between iPhone/iPad/iPod touch and SiDiary online could run into trouble with time slices. The update that this error has been corrected is currently in testing by Apple and will available in the coming days in the AppStore. Immediately after this we will release the sync to our online server again. Due to a bug in the latest iPhone app update, it came to problems during the sync between iPhone/iPad/iPod touch with SiDiary online. In the first sync after the update in some cases the timeslots of the tracked data was changed to 00:00. Recien liberado: Después de una fase intensiva de pruebas podemos ofrecer justo a tiempo para el inicio (meteorológico) de verano nuestra versión de SiaDiary para Android 'App SiDiary para Android'. El archivo necesario para la instalación 'SiDiary.apk' se puede encontrar en tu PC después de una actualización o una instalación nueva. Puedes encontrar información adicional sobre cómo instalar SiDiary en tu dispositivo Android, en el programa, menú "Archivo -> Instalar dispositivos móviles, si seleccionas 'Android Smartphone'. Si eres el titular de nuestra licencia, puedes registrar esta versión para Android con esa misma licencia. Estamos orgullosos de anunciar que ¡Sinovo sigue creciendo! Hemos llegado a un acuerdo para tener un reprentante en México para dar soporte a todos nuestros clientes del mundo que hablan español, incluyendo España y los países de Latino América. Dado que reconocemos que no hay mejor manera de usar una aplicación que en el idioma propio; ahora todos nuestros clientes que hablan español tendrán la experiencia de usar ¡SiDiary en español! Tu ya lo sabes, SiDiary es una agenda para el autocontrol de tu diabetes, ¡desarrollada por diabéticos para diabéticos! Pues, Gerardo Pérez-Ramírez, nuestro representante en México, pertecene a una familia de diabéticos. Gerardo está en Oaxaca y te ayudará a resolver cualquier pregunta que pudieras tener acerca de cualquiera de nuestras versiones de SiDiary, antes y después de tu compra. Gerardo te dará el soporte de primer nivel en español así que por favor con toda confianza pregúntale en español. De hecho nuestro equipo, apoyado por Gerardo, ha estado traduciendo al español todo el texto en nuestra página en Internet https://www.sidiary.es, los manuales y la aplicación misma para asegurarnos que nuestros clientes que hablan español tengan todo lo que necesitan en español. Ahora con la versión actual de SiDiary puedes descargar directamente los datos desde tu medidor de glucosa en sangre 'Sanofi-Aventis BGStar'. Puedes utilizarlo con un cable de AgaMatrix / Wellion Linus. Actualmente, el controlador (driver) necesario está disponible solamente para sistemas operativos de 32 bits. 2007-05-29: 400 educadores en diabetes de varios países se..
CÁDIZ. La diabetes, a pesar de ser una enfermedad con gran presencia en la sociedad, es aún una patología desconocida incluso para los que la padecen. Estos suelen tener serios problemas para decidir cómo controlar la enfermedad en cada momento para que su nivel de glucosa esté siempre, pues es lo óptimo, lo más cerca posible de los niveles normales de una persona no enferma. El problema es que inciden multitud de factores y que no vale con unas pautas simples. Depende de lo que se come, del ejercicio que se hace, y otra variedad de cuestiones, como las hormonas, el estrés, la fiebre o el propio estilo de vida. Todo esto hace que a veces la persona no sepa por qué hoy tiene unos niveles de "azúcar", como se dice vulgarmente, y otro día, unos diferentes. Por esto es imprescindible que el diabético conozca mejor su enfermedad y que existan profesionales formados para ayudarles a ello. Precisamente persiguiendo este objetivo se inauguró ayer en Cádiz el primer encuentro de carácter internacional que organiza la Federación Española de Asociaciones de Educadores en Diabetes (FEAED). La presidenta de la misma, Esther Gil, el presidente del comité organizador y médico del Hospital Puerta del Mar, Augusto Adrián, así como, Juan Ruiz, jefe de Endocrinología del Hospital Lausana de Ginebra, explican algunas de las claves que se abordarán a lo largo del encuentro que se prolongará hasta esta noche. De entrada, Esther Gil, recomienda al paciente que demande a sus médicos y enfermeras una información adecuada y amplía que no se limite a unas simples pautas. Augusto Adrián señala la dificultad de conseguir todo esto pues se "trata de cambiar hábitos adquiridos". Por su parte, además de insistir en la necesidad de que el diabético aprenda a autogestionarse, Juan Ruiz aporta una serie de datos que dejan clara la importancia de mejorar el control de esta enfermedad. Así por ejemplo se prevé que el número de diabéticos seguirá aumentando y será "la pandemia del siglo XXI", teniendo en cuenta el aumento de personas y niños obesos. No hay que olvidar además que la diabetes es la primera causa de ceguera, multiplica por seis las posibilidades de padecer problemas cardiovasculares y, por ejemplo, reduce las expectativas de vida en 10 o 15 años. Por contra, un estudio realizado en Estados Unidos demuestra que si se consigue, cuanto antes, equilibrar la enfermedad las secuelas serán mucho menores 20 años más tarde. Una revisión analiza las enfermedades que pueden presentar pacientes tan jóvenes. - La diabetes tipo 2 se ha considerado durante mucho tiempo una enfermedad de adultos, sin embargo cada vez son más los niños y adolescentes afectados por este trastorno. Una revisión, publicada en 'The Lancet', muestra las principales complicaciones que puede originar este trastorno cuando se inicia tan pronto. Hace unos años, si un niño o un joven presentaba diabetes solía ser la del tipo 1. En esos casos el sistema inmunológico deteriora las células productoras de insulina y el paciente necesita inyectársela para mantener su salud. En cambio, en la forma 2 el cuerpo sí produce insulina pero las células son menos sensibles a ella y los niveles de glucosa se mantienen elevados. En principio, con un control adecuado de la dieta y una buena actividad física estos diabéticos pueden controlar su nivel de azúcar en sangre. Debido al sedentarismo y a los malos hábitos dietéticos, desde hace unos 15 años se están diagnosticando muchos más casos de diabetes tipo 2 entre la población infantil. Así, si antes esta forma era responsable de menos del 3% de todos los casos de diabetes en adolescentes estadounidenses, ahora lo es del 45%. Por este motivo, es importante conocer el tipo y la frecuencia de posibles complicaciones que pueden aparecer en esta población. Esto es lo que han pretendido Orit Pinhas-Hamiel y Philip Zeitler, del departamento de endocrinología pediátrica del Sheba Medical Center en Tel-Hashomer (Israel), a través de una revisión de estudios que ha publicado la revista 'The Lancet'. El trabajo muestra que algunos estudios han detectado que un alto porcentaje de jóvenes con diabetes tipo 2 presenta cetoacidosis diabética (una situación grave derivada de la acumulación de sustancias generadas en el metabolismo de las grasas) y descompensación hiperosmolar (la cifra de glucemia está por encima de 600 mg/dl lo que puede conducir a la muerte). También la tensión arterial puede estar elevada en estos pacientes, de hecho, las investigaciones apuntan que la hipertensión es tan frecuente como en los diabéticos tipo 1. Según la revisión, estos jóvenes desarrollan antes complicaciones microvasculares, como nefropatía (enfermedad del riñón) o retinopatía (deterioro de la retina). En muchos casos estos trastornos están presentes en el momento del diagnóstico. La progresión de estas patologías parece que es más rápida que en las personas con diabetes tipo 1. Aunque algunos estudios han mostrado la presencia de neuropatías, como disfunción eréctil o enfermedad vascular periférica, los autores de la revisión señalan que no hay suficientes datos para poder extraer una conclusión sobre este tipo de complicaciones. En cuanto a los problemas cardiovasculares, la información es escasa. Un estudio realizado en Hungría mostró un aumento de la tensión arterial nocturna (predictor de riesgo coronario) y debilidad del tabique auricular del corazón en algunos de los 22 niños valorados. Un trabajo japonés en el que participaron 1.065 personas con diabetes tipo 2 diagnosticada antes de los 30 años detectó que un pequeño porcentaje de éstas desarrolló aterosclerosis. Por otro lado, los autores señalan que los pediatras no cuentan con guías como las establecidas para las personas con diabetes tipo 2 para controlar su hipertensión o sus niveles elevados de colesterol. Si no se establece un tratamiento que frene estas alteraciones es muy probable que se desarrolle alguna patología cardiovascular o que aumente el riesgo de muerte. En 2003 la Academia Americana de Pediatría, junto con otras instituciones, elaboraron unas guías para mejorar la atención médica de los niños con diabetes tipo 2 de origen indio americano o nativos de Alaska (estas poblaciones presentan más tasas de este trastorno en la infancia). En ese informe se recomendaba realizar pruebas para detectar o descartar tanto proteinuria como microalbuminuria (presencia de proteínas o albúmina en la orina). Algunos estudios han mostrado que estas alteraciones progresan más en los niños con diabetes tipo 2 y, son las señales más tempranas de la nefropatía. La progresión de este trastorno puede conducir a una enfermedad renal terminal. Se aconseja realizar un análisis en el momento del diagnóstico y al mes o tres meses para conocer los niveles de colesterol y triglicéridos. La guía también recomienda llevar a cabo test para conocer la función hepática, ya que las investigaciones muestran que estos niños pueden tener elevadas las enzimas hepáticas. Una exploración del fondo del ojo está indicada al poco tiempo de detectar la diabetes para conocer el estado de la retina. Esta prueba se deberá repetir cada año ya que algunos estudios señalan que en estos jóvenes la retinopatía aparece antes. Según los autores de la revisión, estas guías podrían ser adecuadas para todos los adolescentes con diabetes tipo 2. Iniciar pronto estas medidas podría tener beneficios al mejorar las complicaciones y mortalidad, "este tratamiento no debería posponerse y debería comenzar junto con una vigilancia adecuada", señalan. No obstante, los autores de la revisión señalan que este trabajo presenta algunas limitaciones ya que los estudios analizados eran muy variables y algunos de los participantes pertenecían a poblaciones como la Maorí de Nueva Zelanda que presentan más riesgo de diabetes. Por este motivo hay que ser cuidado al generalizar estas conclusiones. Finalmente, estos investigadores consideran que también se tendrían que llevar a cabo estudios a largo plazo para valorar esta pauta de tratamiento. La enfermedad es la sexta causa de muerte y no siempre se diagnostica a tiempo. La diabetes es la sexta causa de muerte en el país, con una prevalencia de 6,1%, lo que quiere decir que por cada cien habitantes seis son diabéticos. Sin embargo no todas las personas que la sufren están al tanto de ello. Irene Stulin, médico del Servicio de Endocrinología del Hospital Vargas, explica que no se sabe exactamente cuántas personas sufren de diabetes y desconocen su situación "pero sabemos que por cada paciente que le diagnosticamos la enfermedad en consulta, hay otra persona que la padece y no lo sabe porque precisamente no ha sido diagnosticado oportunamente", señala la especialista. La mortalidad de esta enfermedad, que no es más que una condición que impide la correcta utilización de los alimentos por parte del organismo, ha mostrado una tendencia creciente en los últimos años en el país: 4,53% en 1996; 5,03% en 1997; 4,87% en 1998; 5,55% en 1999; y 5,64% en 2000. De acuerdo con Stulin lo que está afectando al venezolano "es su estilo de vida; el sedentarismo es ya parte de nuestras vidas. El apelar a las comidas rápidas, por un lado y la falta de ejercicio por miles de razones entre las que está la inseguridad, porque hay pacientes que no se atreven ni a salir a caminar por temor a ser atracados. Además está la excusa de que uno se para temprano, no tiene tiempo para desayunar en casa; cuando uno llega al trabajo va y se come una empanada con refresco porque resulta rápido y económico. Estas cosas aportan mucha grasa y nos sobrecargan de carbohidratos simples". Según la endocrinóloga la prevalencia de la enfermedad en el país se da principalmente en personas con edades comprendidas entre los 45 y los 70 años, "pero nos preocupa mucho que se ha detectado últimamente que hay cada día más niños y adolescentes con diabetes 2, por obesidad, sedentarismo y malos hábitos alimentarios". La diabetes tipo 2 es una enfermedad que dura toda la vida y está caracterizada por altos niveles de azúcar en la sangre. En países desarrollados está asociada con personas que están en edad de retiro laboral. Stulin recuerda que los pacientes con factores de riesgo son aquellos que tienen antecedentes familiares y en especial los hombres sedentarios, que tienen sobrepeso, asiduos al tabaco y el alcohol; "las mujeres estamos protegidas hasta que llega la menopausia". Y para evitar que la enfermedad siga inadvertida en la salud de los venezolanos, la endocrinóloga del Hospital Vargas su- braya que "la mayoría de los hospitales de Caracas tienen servicio de endocrinología; igualmente algunas cadenas de farmacia del país tienden a ofrecer servicios de despistaje; hay muchas alternativas para que cada quien pueda enterarse si padece o no de diabetes y de ser necesario acudir a su médico para recibir la terapia indicada". Añade que hay otras señas en el cuerpo del paciente que indican la posible presencia de la enfermedad. Entre estas señales se mencionan la medida de la circunferencia abdominal. "La circunferencia abdominal de los hombres no debe medir más de 90 centímetros y la de las mujeres no más de 80", precisa la especialista. Se estima que en Latinoamérica en la actualidad 15 millones de personas sufren de diabetes mellitus y en 10 años la cifra podría llegar a los 20 millones de enfermos, de los cuales 90% a 95% tendrán la diabetes tipo 2. Para el 2025, la población regional de diabéticos podría alcanzar las 40 millones de personas si no se introducen nuevas terapias y/o acciones preventivas. La terapia de la diabetes no sólo consiste en la disminución de los niveles elevados de glucosa en sangre, sino también en la reducción general de los factores de riesgo de sus complicaciones. Esto incluye el control regular de la presión arterial y los lípidos en sangre. Un correcto control de la glucosa en sangre y de la presión sanguínea provoca grandes reducciones en el desarrollo de complicaciones. La dieta y la actividad física pueden reducir el riesgo de desarrollar diabetes tipo 2, indican los especialistas. Pero cuando estos cambios en el estilo de vida no son suficientes, podrían ser necesarios los agentes farmacológicos. 2007-03-12: Sinovo se instala en Barcelona!